Is it a mermaid? Candy Gourlay, illus. Francesca Chessa, London: Otter-Barry, hb. 978 1 9109 5912 1, 2018, £11.99, 28pp. When Benji and Bel meet a strange creature on the beach, what can it be? The creature states with confidence she is a mermaid. Benji with equal confidence knows it is a Dugong. Who is right? Or can you be two things at the same time? 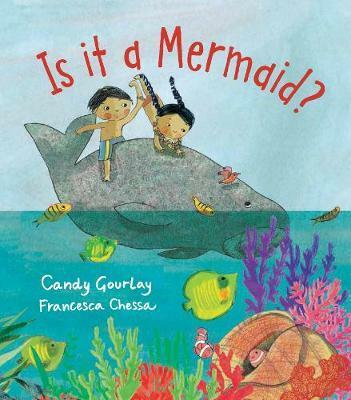 Set in the Philippines – and there is no need to state this in the text, Chessa’s illustrations instantly transport the reader to this tropical world to meet Bel and Benji and, of course, the Dugong. Again, there is no need to want more to explain this sea creature (though the author provides a nice afterword for those adults who might want facts). Rather we are drawn into the world of play where fact and imagination collide – but though the facts are indisputable it is imagination that provides the fun. Gourlay’s text and Chessa’s illustrations work together, bringing the Dugong to life – just look at her expressions – and capturing the two lively children; Bel the willing accomplice in the fiction, Benji secure in his knowledge but finally won over to the game. The author’s tone brings an authenticity to the voices of the characters as they interact – they are real children absorbed in their environment. The artist’s palette perfectly captures the beach landscape – delicious colours fill each spread, the lush green of the vegetation, the cool depths of the sea, the bright fishes and beach creatures. Young readers will enter into the spirit of the game, sympathising with the Dugong when her feelings are hurt by what is patently obvious – she is a Dugong. But wait – what is that tail sliding into the sea as the sun sets? Here in this exciting collaboration, the world of children is perfectly presented bringing it to life subtly with complete confidence and belief.